There will always be a new societal paradigm after the establishment of each technological wave of innovation. When the technological wave arrives, the initial hype will result in a “bubble” which can price market assets at a higher valuation than they are currently worth. This occurs until technology becomes ingrained in society with a consistent market value. Blockchain is not only a technological innovation, but it is also a change in the way consumers and future businesses interact with one another in a more secured and integrated world. Throughout the life of blockchain, the industry has experienced several waves of popularity, including several bull and bear markets for cryptocurrencies. Within the digital transformation of finance, three waves have emerged. The first with payment and transactions, the second with equity financing, and the third wave is where blockchain technologies and security token offerings offer a great amount of potential. The first wave started with payment & transactions when Bitcoin and other cryptocurrencies became popular payment tools. These new currencies disrupted the payments space, which previously only worked using traditional fiat currencies. 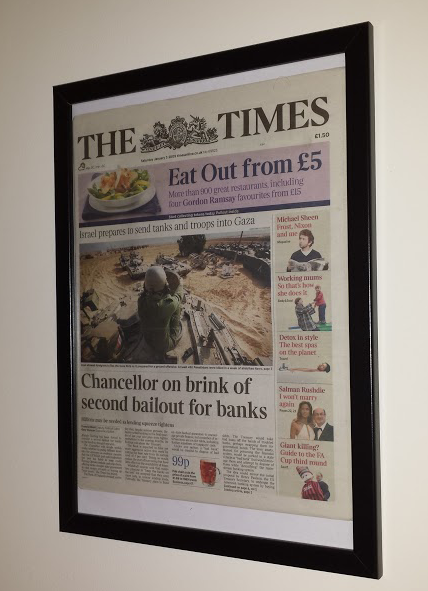 On January 3, 2009, Satoshi Nakamoto left one sentence in the Bitcoin Genesis Block: “ The Times of London | 01/03/2009 | Chancellor on Brink of Second Bailout for Banks.” This is the headline of The Times on that same day when the British Chancellor of the Exchequer was forced to consider a second attempt to relieve the banking crisis. Bitcoin, born after the 2008 economic crisis, echoed people’s discontent with the traditional financial system, launching a new wave of “decentralized” thinking. The second wave was equity and financing, when ICOs became the new means of financing blockchain projects. During the 2017 bull market, token investments gave venture capital funds an exit opportunity providing a high liquidity and rate of return. In 2017, projects could receive funding through an ICO with just a white paper and promotion from Twitter influencers. Their token would get listed quickly on an exchange with relative ease. Sophisticated investors and crypto enthusiasts alike from all around the world could invest in their tokens by simply signing up with a crypto exchange, transferring crypto to their accounts, and making the trade. The catch was that these tokens and the entire ICO process are unregulated. The lack of regulation gave opportunities to scam projects to sell worthless tokens to mislead investors. Amid the regulatory uncertainty, ICOs surged due to getting funding from many hyped investors. As a result, a hundred times return on an investment became “reasonable,” giving cause to the “bubble.” In the later half of 2017, ICOs were on the radar of the SEC after many investors lost money on fraudulent projects. The regulatory body deemed ICOs as a security offering, thus subject to securities laws. On September 4, 2017, China decided to shut down domestic exchanges and ban ICOs. However, the global market cap for all cryptocurrencies had already reached over $160 billion. Many people hoped that investing in these ICO projects could make them money while also speeding the growth of FinTech. Today, China is experiencing a downward economic cycle with soaring debt, shrinking balance sheets at the central bank, increasing currency control, and a destructive trade war. In fact, it is not only China: the global macroeconomic turmoil and the prices of cryptocurrencies are becoming inversely correlated. According to BlockVC’s strategy research, since Venezuela’s issuance of the Petro Coin, cryptocurrencies have come into consideration as an increasingly popular means for emerging market countries to ease their national currency and debt crises. 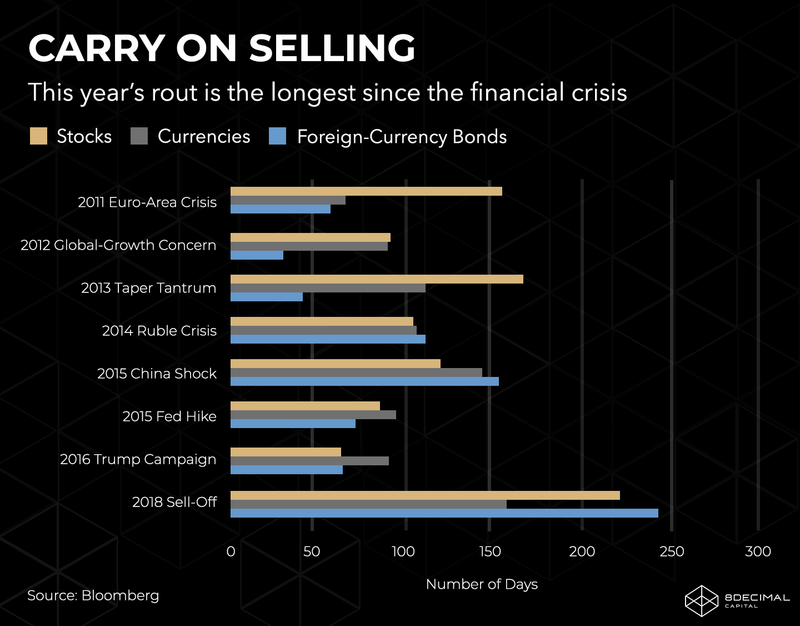 With the decline of global cross-border capital investments, the fiat currencies of Turkey, Brazil, Argentina, South Africa and other countries have sharply depreciated, causing economic turbulence. More importantly, due to the effects of globalization, all economies are intertwined. When economic markets experience decline, these effects are negatively felt elsewhere causing further financial volatility. Contrary to the traditional financial markets, blockchain and cryptocurrencies are global by nature. Cryptocurrencies face global markets with tens of thousands of exchanges. However, different governments have their own attitudes toward cryptos, making consortium agreements between multiple countries difficult. Many projects have taken advantage of this by obtaining legal and compliance documents from policy-friendly countries, such as Singapore and Switzerland. For example, projects can be registered in Singapore, receive capital from venture funds that are registered in Switzerland and Cayman, then become listed on exchanges in Malta due to the ICO-friendly policies of these countries. In response to the aforementioned global policy phenomenon, Tim Draper, a prominent American venture capitalist, said that the most exciting feature of Bitcoin is that it is a global currency. In the future, governments will become public service providers that need to compete openly, rather than being monopolies of specific regions. In the future, governments will act as service providers for their customers: the citizens. As citizens, people can choose the products they buy and the businesses they choose to work with in certain cities. As such, governments will have to compete amongst each other with regulation and legislation. ICO businesses will flow, as a result, to the markets with government service providers which are most amenable to their development. Because of the nature of this industry, countries, especially small countries, will have a FOMO (Fear of Missing Out) effect. They will not want to miss the opportunity to grow their economy, so these emerging markets will be more likely to set up more blockchain-friendly policies. Since innovation always comes before regulation, people can financially benefit from this critical time period by making strategic investments into this innovative technology. With an ever growing influx of projects, the supply of capital in this industry is insufficient. When the supply of projects exceeds investment demand, according to the rule of supply and demand, a large number of token prices will inevitably collapse. This has been seen in the most recent ICO market correction. Good timing and thorough due diligence are key to investing in the blockchain space. The early adopters of the next revolution can often profit from investing early. However, when the revolution becomes overhyped, bubbles form. Consequently, late adopters and imitators often face substantial losses. Such was the outcome in 2018. In order to survive the speculative conditions and control losses, projects generally began to sell their depreciated ETH from financing. This had a cascading effect and was one of the principal impetuses to the collapse of the price of ETH and other cryptocurrencies. We are in a transitioning period right now: the “trash coins” are not entirely cleared out of the market and new funds haven’t decided to enter the market. It is likely the market will continue this bearish state for the time being until a new catalyst arises, possibly regulation. The inflection point initiating new trends will appear only when blockchain-related assets are incorporated or opened to a larger, institutional market. From the first wave of payments to the second wave of equity financing, unique technology has been developed from the infrastructure level and up. The first wave, payment and transactions, gave birth to wallets and secondary market platforms. The second wave, equity financing, brought forth a digital version of investment banks to provide investment, underwriting, market making, refinancing and a package of services such as rating, research and other offerings to mirror the traditional financial services industry. Combining the efficiency of a new age of digital investment banks with regulated tokens leads into the third wave of blockchain in finance. As we continue to build the blockchain ecosystem, we see a high potential and yield for this new third wave of financial evolution. Look out for tomorrow’s article where we analyze this third wave of blockchain evolution and why this third wave of investment will revolutionize the blockchain and crypto worlds. 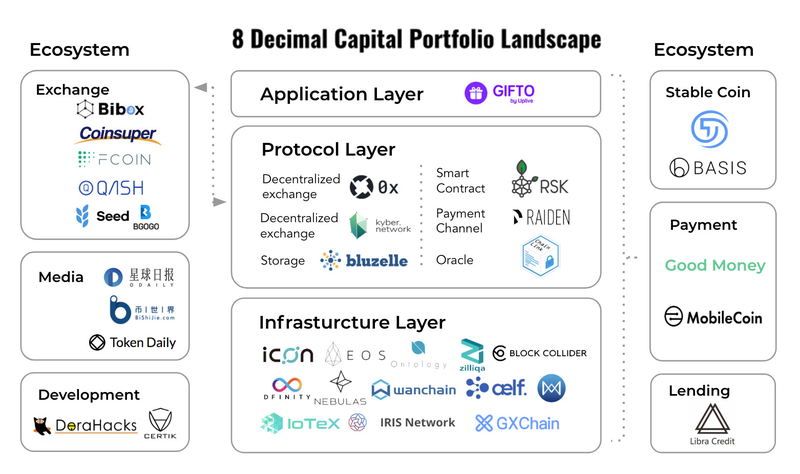 8 DECIMAL CAPITAL is a multi-strategy investment firm focusing on token and equity investments. 8 Decimal currently has more than 40 portfolio companies with an AUM of 60M USD. The investment team consists of more than 10 venture capital veterans, researchers, and trading professionals. The advisory board comprises Fan Zhang (Former Founding Partner of Sequoia Capital China), Karen Chen (Former CEO of UBS China) and Ben Bartlett (Vice Mayor of Berkeley). Based on the professional fund index ranking agency Token Metrics, 8 Decimal was ranked second out of the 51 active crypto funds. 8 Decimal is also well-received in China, named one of the top 10 funds in the blockchain industry by both 36氪（36Kr.com）, Chainbs, and Odaily, as well as named one of the top 20 funds by Tsinghua X-Lab and Youth Education Chain League.